Farm Size- What’s It Mean? One question I get asked a lot is if we are “big farmers.” That is such a tough question to answer these days. Define what big is? If we farm two 180 acre fields, some consider that big. Especially if they only own a half-acre lot in town where their house sits. I know farmers that farm 200 acres and farmers that farm 20,000 acres. To really understand what that means, first you have to really understand how big an acre is. The easiest visual I can give you is a football field. One acre is approximately the size of one football field. So, you can imagine the time that goes into a farm that may be 20,000 acres. That is 20,000 football fields that need to be lovingly cared for every day! Which brings me to another thing on farm size. The people! Farms could be big, but big farms also take lots of people to take care of it! One thing that I am always thinking about when it comes to farm size is growth. Our operation would love to grow and expand, and honestly, I don’t know a lot of farmers that would turn down an opportunity for growth. But, land is also hard to come by. And as the world continues to grow- we are at 8 billion and growing- that means cities grow bigger and bigger, and farm land grows smaller and smaller. So, naturally people tend to hold on to land for as long as they can, another reason it’s hard to come by. One thing that I think is a really wonderful thing to know is that our acres may seem big, but 98% of farms are FAMILY OWNED and OPERATED! 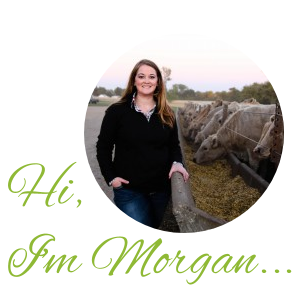 So, that farmer I know that farms over 20,000 acres…It’s a family operation, which is amazing! Farm size varies from farm to farm. But, whenever you hear that someone farms about 5,000 acres, just think of Sundays when you are watching your favorite football teams. And picture 5,000 football fields that need to be worked, planted, and harvested every year. And that there is a hard working family behind those 5,000 acres.